On this page you will find links to articles we think you will enjoy and benefit from. (Click on the title above to view the article.) We are concerned, just like you, about the safety of consuming genetically modified organisms (GMO). Practically all processed foods that do not bear the USDA Organic seal contain GMO ingredients, and so it is likely you have consumed GMOs. This article not only discusses the organ failure in laboratory animals after eating GMO feed, but references the lack of long term studies needed to determine the safety of the product. Because Monsanto holds the patent on these seeds they control what research is done, and all but two studies have been for periods of 90 days or less--not nearly enough time to find chronic toxicity. Particularly troubling, is the reference to a human study where participants ate Round-Up Ready soybeans (genetically modified to withstand otherwise lethal dosages of herbicide). Over 90% of all US soybean is GMO so this is not an unlikely scenario. "In three of the seven volunteers, the gene inserted into the soy transferred into the DNA of their intestinal bacteria, and continued to function long after they stopped eating the GM soy!" (emphasis mine) So not only does the inserted gene disrupt the genetic code along the DNA chain of the target species, it can transfer to other species and disrupt their genetic code! Obviously, we have no idea of the long term effects of pushing ahead on something we know so little about. Summary by Wally. (Click on the title above to view the article.) Comments by Wally. This article and the accompanying video with Dr. Allan Savory is a must read/view; the video is especially good. 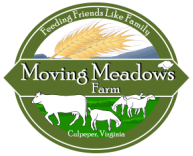 It explains what we are trying to do here on Moving Meadows Farm using herd animals to mimic nature as a way of reclaiming abused land. Dr. Savory explains how desertification (the encroachment of desert) is the number one threat to our food supply and how the ONLY solution we have to reverse the trend is mob grazing. Dr. Allan has some very exciting case histories of returning desert to lush grassland. Dr. Allan is the one who trained the men who trained me on grazing methods--Ian Mitchell-Innes and Greg Judy. Enjoy and pass it on. (Click on the title above to view the article.) Comments by Wally. I was not surprised to learn from this article that conventionally raised beef from Concentrated Animal Feeding Operations (CAFO's) sold at grocery stores was found in a recent study to have "startlingly high levels" of antibiotic resistant bacteria like salmonella, Campylobacter and E. coli. By contrast beef from cows fed their natural diet--grass--is rarely contaminated since their gut in not acid enough to support the dangerous bacteria. The article also warns against meat-glued steak (scrap pieces glued together to look like a whole steak), noting that it is much more common than you think, and a prime source of contamination. You might find the discussion of produce helpful too. The article also lists the produce types that have the highest levels of chemical contamination, when grown conventionally, and the produce with the lowest levels, when grown conventionally. Obviously, produce grown organically is the safest, but if you have to skimp on a tight budget, purchase the low risk produce conventionally and save your dollars for the organic version of the high risk produce. The use of pesticide tolerant GMO seed allows farmers to spray otherwise lethal doses of herbicide on their crops, resulting in higher concentrations of pesticide in the harvested food. Such is the case with RoundUp Ready seeds by Monsanto. The active ingredient in RoundUp herbicide is glyphosate which is now showing up in an alarming number of foods as well as in people. The interview linked above explores the devastating effect of glyphosate on human health via the havoc caused in the gut. The interviewer, Jeffery Smith, is the founder of The Institute for Responsible Technology (www.responsibletechnology.org) and one of the most prominent voices in the fight against GMO's.